Why 100% Pure Australian Emu Oil ? The remarkable properties of Emu Oil are undergoing extensive research from several of the leading Research Institutes and Universities in the U.S. and Australia. Emu Oil is a highly marketable oil which is currently being introduced to many health and beauty companies internationally. Testimonials from users of Australian Emu Oil and studies by credible sources have awakened the world all over to Emu Oil's extraordinary attributes. Emu Oil contains Omega 3 and Omega 6 oils and correctly processed Emu Oil can appear in several color shades, from crystal clear to milky white to light yellow in color. One of the largest companies utilizing Emu oil in the U.S. has found the effectiveness of Australian oil to be superior to that of US oil in the manufacturing of their product line. There is a higher level of accountability in Australia, from growth of the bird to the final refining process, as their version of the FDA and USDA is stricter. Australian Emus consume a diet that is almost exclusively, and in some cases exclusively, made up of natural leaves, bushes and insects that provide the Emus with a resistance that birds in the U.S. generally do not have, thus eliminating the need for medications. It becomes apparent from the above chart how inferior genetics could result from generation to generation in U.S.-raised Emus. 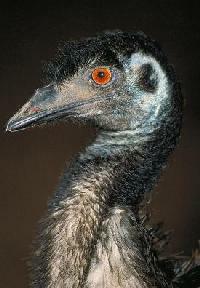 Both Australian and U.S. Emus produce different types of oil when raised in different geographic areas. Some of this is due to dietary differences, some due to external. All Australian oil, in our opinion, is of a superior quality. Some lots of oil that may vary in color appear to be even more biologically active than other lots. There is a biologically active yellow-colored component present in most Emu oil, but more abundant in some lots of oil. There have been patents granted by the US government (to a group of Australian researchers) relating to the anti-inflammatory capabilities of this yellow-colored component. These Australians have conducted over a decade of research on all facets of Emu oil and the genetics of Emus. This yellow shading is very common among batches of Australian oil. Our first-hand observation of the refining process in Australia is that it is unequaled in cleanliness and technology for low-temperature refining compared to the vast majority of processing and refining facilities in the US. Our oil is continuously refrigerated at 34 degrees Fahrenheit in lightproof containers, giving it an indefinite shelf life.